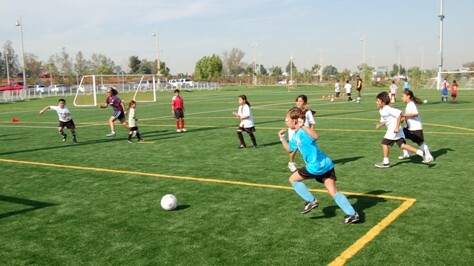 Children playing soccer at Ontario Soccer Park on Opening Day. Programs maximize the use of facilities, enrich the lives of residents, and strengthen social networks. Ontario’s park facilities should be programmed to provide a range of recreational, cultural and educational opportunities that meet the needs of the entire community. As needs continue to evolve, we will respond by involving community members and organizations in programming, fostering a sense of ownership and increasing park usage, thereby creating a safer park environment. A range of recreational programs provided by public, private and non-profit organizations that meet the needs of the community’s varied interests, age groups and abilities. Participation. We program park facilities to maximize utilization and participation, while considering park size, location and population served. Needs Assessment. We track the needs and priorities for recreational programming and look for ways to meet demand. Community Involvement. We involve the local community in planning programs for neighborhood and community park facilities. Access to Programs. We provide a range of program opportunities for residents of all income levels. Partnerships. We partner with local and regional agencies, non-profit organizations and the private sector to provide a comprehensive range of recreational programs.